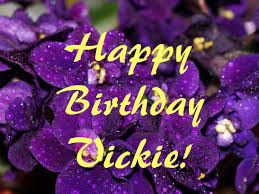 Happy Birthday to my beautiful daughter, Vickie. No matter how old you get, you will always be my baby girl. The miles may separate us but I think about you every day. Today I am remembering how small you were and rejoicing in all that you have grown to be. Having you as my daughter has been one of my greatest accomplishments. My wish for you is a better tomorrow that is full of promise and hope. My wish for you is that you will never give up and that your inner strength will help you when you feel you’re at the end of your rope. My wish for you is happiness and that you get a taste of all good things. And my wish is for you to have a wonderful life and all that it shall bring! I hope you have a wonderful birthday. I miss you more than you will ever know! I love you to the moon and back a million times, and a million times more.